You may have resigned yourself to a life of uncomfortable bridges or dentures because you think dental implants are too expensive. If dental implants seem like an impossible dream, there’s good news. Dentures and partials that slip and interfere with everyday activities are an unnecessary nuisance when better alternatives are available. If you take the long-term value of dental implants into consideration, you may find they are well within your budget. Dental implants are cylinders implanted into the jawbone to create artificial tooth roots. When these rods, usually made of titanium, fuse with the bone and become anchored in the mouth, artificial teeth are placed on them. These teeth remain permanently in place, and they look and function just like your natural teeth. If you need a full set of teeth, a few strategically-placed implants can anchor a set of dentures in your mouth, so you need never worry about them slipping again. 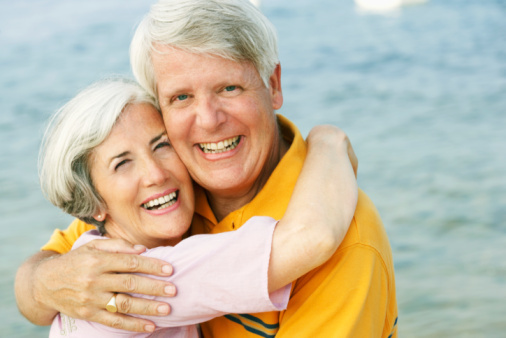 What are their advantages over dentures? Implants have a more natural appearance and are more comfortable than partial or full dentures. Once they are in place, you will treat them like regular teeth. They will never fall out or need to be removed for cleaning. Also, because they are inserted into the bone, they constantly stimulate the jawbone, which leads to less bone deterioration as you age. While some insurance companies cover dental implants, most do not. Implants are much more expensive than dentures, but consider them an investment in both your financial and physical health. Dentures may be less expensive, but denture wearers experience large quantities of bone loss in their jaws due to lack of stimulation. This bone deterioration not only changes your facial appearance, but it also requires frequent dental visits for adjustments and refitting. With dentures, you could end up spending as much money on office visits and replacement dentures as you would on implants. An up-front investment in dental implants can help you avoid considerable hassle and help you maintain your bone health. If you’re ready to ditch your dentures for dental implants, call Drs. Alex Denes and Claudia Denes today at (559) 297-1800 for a consultation. Fresno Dental Studio serves patients in Fresno, Clovis, Sanger, Mendota, Orange Cove, Reedley, Selma, and the surrounding areas.